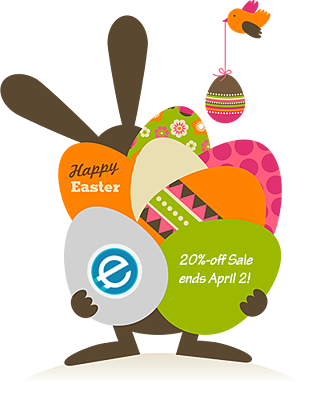 An Easter Eaves Sale! 20% off this weekend only! Hi all, we've been busy behind the scenes over in Empire Avenue land, but we wanted to let you know that we thought we should let Rudiger, our Empire Avenue squirrel, dress up as the easter bunny. His first task was to drive a sale on Eaves with a 20% off sale! To take advantage of the sale, simply go straight to our Shop and purchase any of the items marked on sale! If you've wanted to Create a Mission and didn't have the Eaves to do it with, take advantage of the sale which will end Tuesday April 2, 2013! Disclaimer: Our owners, writers, and/or guest post authors may or may not have a vested interest in any of the above projects and businesses. None of the content on this blog is investment advice nor is it a replacement for advice from a certified financial planner.